Your Grandma Betsy or Uncle Dave makes the best biscuits. I know, I know. That’s the problem with finding the ultimate biscuit. Every person has their ideal biscuit. Something that can stand up to gravy or can be built into an egg-like sandwich. I asked this question a few months ago and got a different response for each person’s “ideal biscuit”. So, this recipe is my favorite biscuit. It’s what I want in a biscuit and I’m at peace with this decision. I’ve heard things about White Lily flour — that WL makes the perfect light and fluffy biscuit — but, as I live in the Pacific Northwest, they don’t sell WL flour. 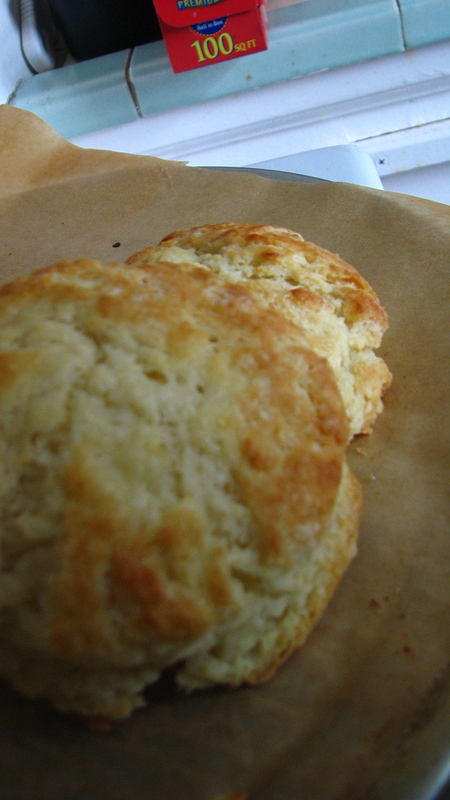 If you want your biscuits to be ultra cakey, use bleached self-rising flour. I prefer unbleached, but do what you gotta do, ya know? We all derive our favorite recipes from a base recipe. Buttermilk biscuits all the have the basic things: AP flour, buttermilk, butter, salt and usually baking powder, baking soda or both. In a food processor, combine flour, salt, sugar, baking powder and baking soda. Pulse a few times to mix. Cut the cold butter into “tablespoon-sized” chunks and put them in the flour mix. Pulse until butter is well incorporated. (About the size of peas — maybe a little smaller). Dump your flour/butter mix into a large bowl. A large bowl is kind of necessary because this part can get messy. Make a well in the middle of the flour mix and pour in your cold buttermilk. I generally use my index finger to mix/swirl until it all comes together. If it looks too dry, add a little more buttermilk. If it’s too wet, add more flour. You don’t want wet biscuits going into the oven. Once the dough comes together — meaning it sticks together without crumbling apart — dump it onto a lightly floured surface. Press down into a 3/4 inch rectangle shape. With a biscuit cutter or metal tin, cut out your biscuits, reshape and repeat. I’ve found this to be an important step. By not twisting the can or cutter, it gives the biscuits the ability to rise significantly, giving them those beautiful little layers. Lay them on a baking sheet lined with parchment paper (or lightly oiled/sprayed). Brush the tops with buttermilk and stick them in the oven for 13-16 minutes. Of course, if you don’t have a food processor, you can use your hands. It’s important to cut the butter into the flour as small as you can. A food processor makes this easy, but is not necessary by any means. I’ve used cheese graters to cut butter in. Works just fine. Anyways, you get something like this. I wish I had a better picture, but we ate the really pretty ones before I remembered to take a picture. I think we’re getting a good camera soon, so this blog will be like, 10X’s as awesome. Or…maybe just 5X’s as awesome. Either way, it’ll be rad. I hope you can try these — there’s nothing like warm biscuits right out of the oven with some good homemade jam. The good thing about these biscuits is that you can cut them in half and they hold pretty well. Meaning, you can make them into a sandwich or just dump a mess of sausage gravy over the top! Hudson Cream is another fine Southern flour that I use for my cat head biscuits. Two weeks ago, I churned 10 pounds of Jersey butter then used the buttermilk for both biscuits and cornbread; slathered both with butter and homemade jam. Oh My. Delicious doesn’t begin to qualify.